Back to 2007, TRAI has set up a National Do Not Call (NDNC or DND) Registry to curb unsolicited Promotional or Commercial Calls/Messages arising from Telecom Systems to protect consumer interests. It was in 2010, I attended a cousin’s wedding where I and a few others had to take care of all the arrangements for the ceremony. As usual a hectic workload managing things, receiving calls, answering them all day long. Most of the time came across making/receiving calls from new numbers because it dealt with people from different services. Those which irritated me a lot during the work are the Commercial/Promotional calls and messages especially the Caller Tune calls – “Hey are you bored of that Boring Tring Tring?” Who the hell in that situation expect a stupid promo call from different Numbers all the time? While the story ended – There is always a similar or different situation of such kind which each of us had faced. Isn’t it? The DND set up in 2007 failed to help customers or protect consumer interest (Similar way happened to me in 2010) and in 2011 TRAI again came up with a new Regulation for Telecom Operators called National Customer Preference Register (NCPR). Thanks to TRAI regulation which helped us to secure some peace of mind. Now with the growing knowledge of DND among most mobile users, guess what? These Telecom Operators being disruptive innovators in chasing every scope to reach users discovered a new way to grab the attention of users – The Call Connection/Establishment time. 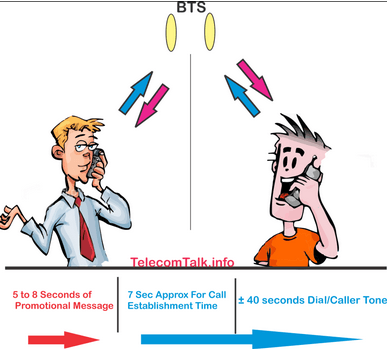 (Time during which the call gets connected to caller Tone or Dialer Tone of the called user – leaving technical aspects aside). I called From a X Network to a Y Network: (X Promo Message 5 sec) – Recharge with RC so and so and get so and so benefit (4 Seconds) gap now another promo(Y Promo Message 5 sec) Recharge with RC on your Y and get benefit of so and so and then the called person phone rings – Tring Tring or any Caller Tune depending. Now the call establishment time is really increasing with these messages, isn’t it? Now, I’m literally confused which Network am I using? Is it X or Y? 1. For the Benefit of the Customer to inform any special offers and the other is. Though the former is welcomed, the later is not welcomed and not a good sign of practice. I don’t understand one thing with case 2: why any person from other Network wants to hear offers on a Different Network? This is just a publicity or promotional trick I can say. I’m also confused if this is any kind of bug with the system (enabling promo for both Incoming or outgoing) or a known customization. If anyone from Telecom Operator Authority read this article please enlighten me via comments if “There are any criteria’s followed in selecting users those who get these promo Recordings, Any usage algorithms or just random basis because I have two Vodafone Numbers and the situation varies differently” so that I’ll use my Numbers patterned accordingly. Aircel: enabled this promo messages both for Outgoing and Incoming calls. Though bad considering this for incoming calls it has taken measures not to exceed 4-5 seconds and the promo speeds like fast forward message. At least a step is taken to protect user interest. Reliance: Seems Reliance provides their brand Tune for free as caller tone to most of its users. Can appreciate this facility and if operators want to publicize their users on Respective Networks they can provide their Brand Tune for free to their users. And wow to the recent innovation of Reliance, it mixed both the promo message and Brand Tune together and started to play as caller tune for users. Vodafone: Shockingly Vodafone is not giving any promo message in outgoing calls but in the incoming calls. A sort of disturbance to called users. Uninor: Though it’s not the daily case with Uninor, surprisingly I heard a promo about an RC today which actually is a benefit but after few repeated outgoing calls it annoyed me even. Every promo message is beneficent only when there are certain limits. If the announcement limit exceeds it will be a mess and nuisance to both the caller and called parties. And a funny quote by my cousin – By the time she wants to convey any urgent happening and her call gets connected chasing out these annoying promos the then Present tense will become a past tense. Instead of these annoying voice promos before the establishment of a call, Operators can silently send an SMS informing the users about various offers who are not subscribed to DND. Green Category Refers to Operators which did not show any sign of promo voice message between the call establishment times. Red Category refers to operators which showed outgoing / incoming or both signs of promo voice message between call establishment times. I hope operators provide pure and simplicity based calling services without this annoying stuff before a call gets connected. Have you experienced such annoying promo messages before a call being connected? If so on which Network and Circle, please let me and other readers know. *All the Numbers used in this testing are Local GSM numbers of same Circle and not active on any DND, May differ with people active on DND or with premium Numbers / Users. Uninor’s the worst. There’s like 1 paragraph message for every number you dial. Can TRAI follow UK regulator Ofcom’s approach to obtain ground level data from Wired and Wireless Subscribers? Who killed native Video calling ?